Critical Inflection Point test for Banks in play! The Banking sector often sends a very important message to the broad market. Banks are at a price point where they could send a very important message to the overall market. This 2-pack looks at the Banking Index (BKX) and the Equal Weight Bank Index (KBE) over the past 14-months. Both indices sent bearish messages to stocks over the past year, as a negative divergence with the S&P 500 started in January of 2018. The counter-trend bounce off the December lows has each index testing 50% Fibonacci retracement level, which comes into play as resistance. 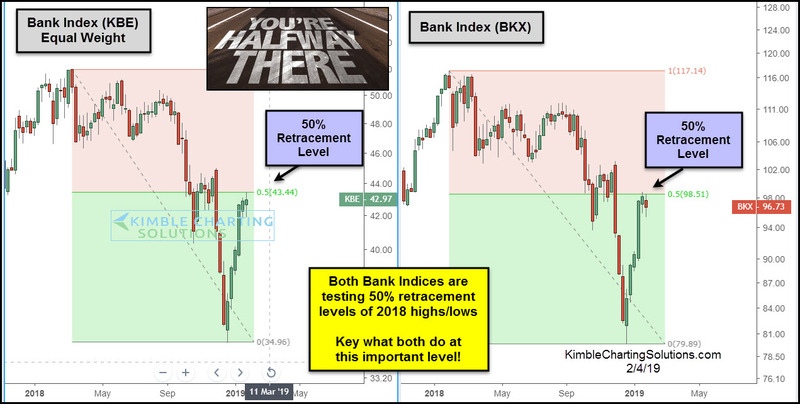 Since Banks, were downside leaders in 2018, what they do at the “Half Way Point” of last years highs and lows, should send a very message important to the broad market!